Subject to changes at the discretion of LIFE Hot Yoga Management. The Management reserves the final rights. Terms & Conditions apply. Commit to Your Practice. Transform Your Body, Your Life and Your Outlook. Various membership options to suit your needs and schedule – whether you are planning to come once a week, twice a week or more than twice a week! LIFE Hot Yoga will automatically deduct your monthly payment from your credit/debit card at no hassle to you. 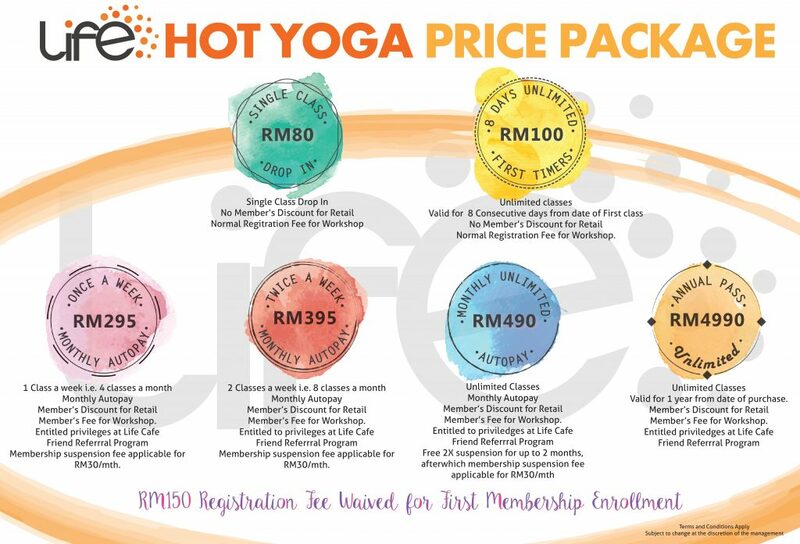 For the monthly unlimited membership, the more classes you attend , the less you pay per class or simply RM 16.33/day for the monthly investment of RM 490 for unlimited number of classes. Flexible membership options. Upgrade and downgrade among membership options available to fit your schedule at no charge with advance notice effective on next billing date. Registration fee waived for first membership enrolment, no processing fee and no contract. You can inform us one month in advance to cancel your membership with no penalty charges. Discounts on future workshop and 10% off at our yoga retail boutique. No worry about unused and expired class credits. Express class check in with your personal membership key tag at your privacy. Suspension of monthly autopay membership available for RM30 per month (up to 1 month period); Monthly unlimited members enjoy 2 times free suspension for up to 1 month per suspension within a membership year. Subsequent suspension per month will be subject to RM30 administrative charge. Your Life, Your Health, Your Journey. Becoming the Best version of Yourself!